Removing programs installed in your Mac can range from very easy to a little tricky, depending on the software you are trying to remove, how familiar you are to Mac and what methods you use to uninstall the programs. Mac OS does not have an equivalent of Windows Registry which you can use to uninstall all programs, and neither does it have the “Add or Remove Programs” functionality. The easiest and most common uninstall technique in Mac is dragging the programs and dropping them into the Trash to uninstall. However, this technique may not be so effective in removing all the program files. In this post, I will highlight a few ways of uninstalling programs in Mac and to ensure that even the program preferences and created shortcuts are removed as well. Applications (Apps) are bundles. These are programs with *.app extension like iTunes and Safari. If you check in the Finder (or the Applications Folder}, you will see a special folder itself which looks like a single double-clickable file. Such a “folder” is self-contained, meaning that it has all, or most, of the files that are required to run the application. You can remove applications by dragging this folder to Trash. You will know such a folder is a bundle if you will see “Show Package Contents” when you control-click or right click it. In some cases, an uninstalled program may leave behind preference files, and support files, since these may not be stored in the application bundles. Although preferences files take up negligible space, it is wise to delete them, especially if you do not plan to reinstall the application at a later time. Preferences are stored in the user’s Library Folder (~/Library/Preferences) or in /Library/Preferences/ within the system-wide Library at the root of the system volume. Depending on the program type, application files may take up anywhere between a few kilobytes of disk space to as large as several gigabytes. The support files are located in the Application Support folder inside the user’s Library folder or inside the /Library/Application Support/. Before you remove support file sand preference files, ensue that the program is not running at that particular time. There are some programs that have their own uninstallers. You should first check whether the program can uninstall itself before trying any other technique. You can check this during installation or simply look it up in the support files. 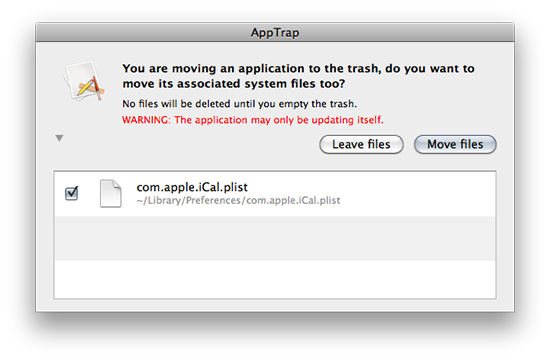 If you are a geek, you might try using third party uninstallers like AppTrap, AppDelete or AppZapper to get rid of a program and all files associated to it. Next: Android Gingerbread – What’s New ?